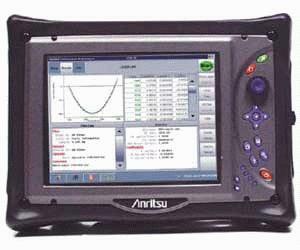 The field portable CMA5000 OTDR/Chromatic Dispersion (OTDR/CD) measurement system is a dedicated module that combines the advanced capabilities of the Anritsu OTDR technology with the Anritsu experience in Chromatic Dispersion. The CMA5000 OTDR/CD measurement system gives installers and network providers a combined module that can be used as an OTDR and a chromatic dispersion measurement system, reducing testing times while increasing network performance. The CMA5000 OTDR/CD measurement system is based upon the industry accepted time-of-flight measurement method (FOTP-168) that can evaluate chromatic dispersion of individual fiber links. Utilizing a single fiber for the test and multiple wavelengths results in an inacrease in the accuracy of the measurement, as well as a reduction in the testing time. This translates into improved network performance and efficiency, resulting in increased revenue for the network provider.